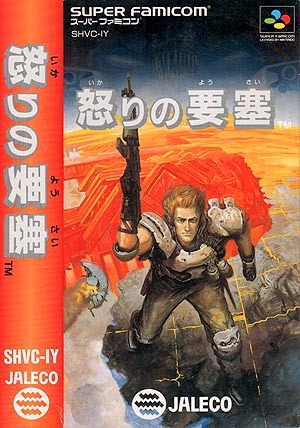 Ikari no Yōsai is a top-down overhead shooter by Jaleco and features a heavy armed warrior whose given task is to infiltrate a science laboratory and to find out what happened there. The uninviting place is now filled with legions of hostile aliens and odd-looking devices are scattered around every corner of the sprawling station. The player first comes equipped with a single Vulcan gun and a triple direction laser, but more sophisticated weaponry and items are later available such as the flamethrower or the reflective laser. As the game progresses, maps of the visited areas reveal their secrets and special booths give the player some clues on what exactly happened in the station (through simple animated cutscenes). But Ikari no Yōsai is more than a simple overhead shooter, the game features many puzzled and some areas can be only unlocked by using a specific weapon or item. Ikari no Yōsai was also released for the Nintendo Game Boy in 1991 and a sequel called Ikari no Yōsai 2 followed in 1992. 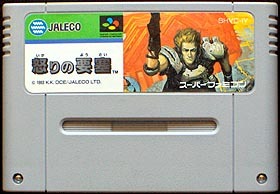 Even if they were both overhead action shooters produced by Jaleco, they do not seem entirely related to the Super Famicom version tested here.